In the Michel catalogue, you will not find a category for "Deutsche Besetzungsausgaben Ukraine 1914/18". 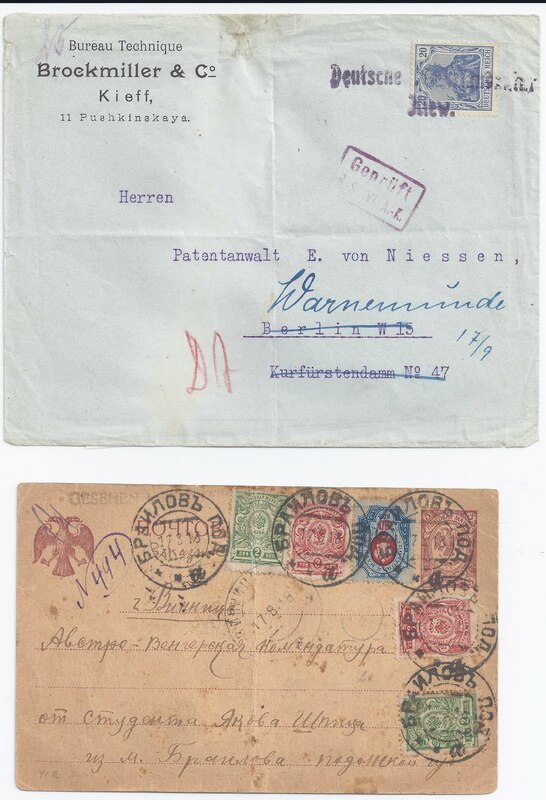 The German Army was all over Ukraine in 1918 but it did not issue occupation stamps. That is because it was there as what we might now call a Stabilisation and Assistance Force, supporting the new Ukrainian National Republic. German troops wrote home through the Feldpost. Some civilians also had access to German military postal services. I had never seen examples of that until I viewed the Zelonka collection last year but I have now acquired an example (above) from the Robert Taylor collection. This shows a Kyiv - based company sending a letter to Germany through the Deutsche Kommandatur / Kiew and using a 20 Pf Germania to do so. The violet cancellation is undated but the manuscript remarks on front and back of letter indicate it was sent on from Berlin to Warnemünde on 17 September 1918.